If you have a little one at home, you know how much they love to repeat the actions they see you do. They’ll set their spot at the table, put on their own shoes, and brush their own hair. Even young toddlers want to be involved — the great news is this is an important part of a child’s development (source). Looking to include your child in daily activities while encouraging responsibility and modeling chores? A toy vacuum can do just that. In this article, we’ll look at some of the things you’ll want to keep in mind when shopping. Then we’ll go over some of the best toy vacuums out there. Use the links above to check the latest prices or read our in-depth kids toy vacuum reviews below. You may have a lot of questions when picking out a toy vacuum for your child. We’ll answer the main ones here. Do you need a functioning vacuum? Many toy vacuums are strictly toys, and may or may not make noise. Then there are some “toy” vacuums that actually work, so determine what you want in a toy vacuum before you start shopping. How old is your child? A toy vacuum for a young toddler will be quite different from a toy vacuum geared for an elementary-aged child (source). One of the main differences will be in the height of the vacuum. You might also find toy vacuums geared toward older children have more features they’ll love. Corded, battery operated, or entirely manual? You’ll run into the whole spectrum here when it comes to toy vacuums. Toy cordless vacuums and rechargeable, fully functional toy vacuums also exist. Non-functioning toy vacuums may run on batteries for sound and lighting effects. What’s your budget? You’ll find something at every price point. From brand name models you’d use yourself to well-respected toy brands and economy versions, toy vacuums are quite popular. Determining how much money you want to spend can help narrow the list of options. Other considerations: What kind of space do you have for storing your new toy vacuum? How many children do you have and how long do you expect this toy to be used? It’s never too early to teach your little ones about household responsibilities. Adding some fun to the mix is even better! Whether you want a fake toy vacuum or a more realistic option, we’ve got you covered. 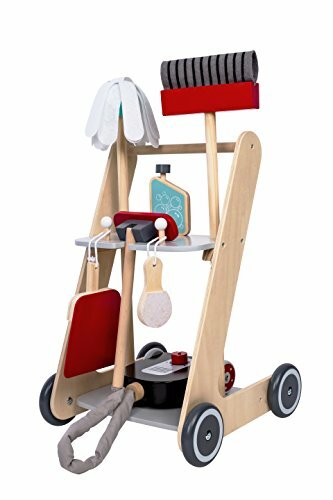 This wooden cleaning cart is sturdy and attractive. Seven different cleaning accessories like a mop, vacuum, and broom are included to provide hours of imaginative fun for your child. It also meets EU and US safety standards. 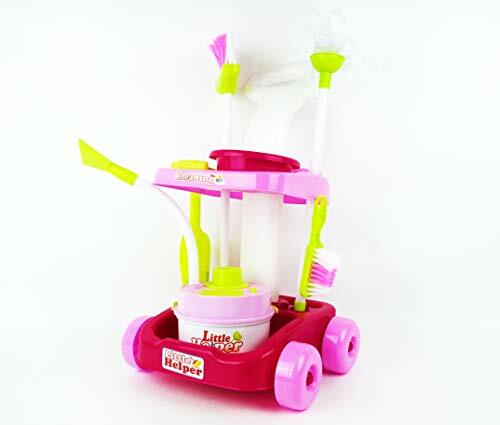 Great for children ages 3 years old and up, this cleaning set has four wheels and moves easily from space to space. Easy to follow instructions for assembly are included with this toy set. 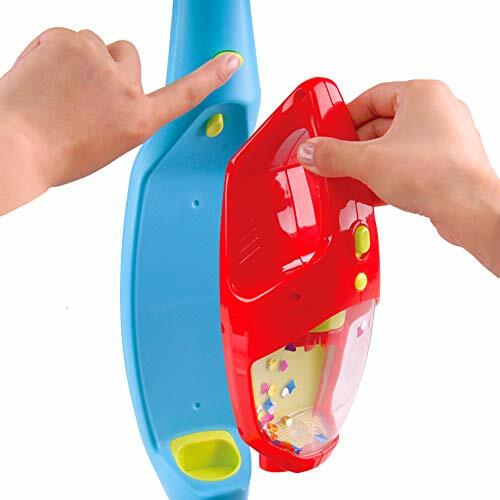 This classic toy is easy for young toddlers to maneuver. Brightly colored, lightweight, and with a low center of balance, this baby vacuum allows your child frustration-free pretend play. Wide-set wheels let this unit run easily over both carpet and smooth floor. The balls in the unit pop when in use, and make a satisfying noise your little one will love. Suitable for children ages 24 months and older, this is also a perennial favorite for older children as well. No batteries are needed. This lightweight and brightly-colored vacuum sports two pieces. A handheld vacuum and an upright vacuum have lights, whirling beads, and sound effects. 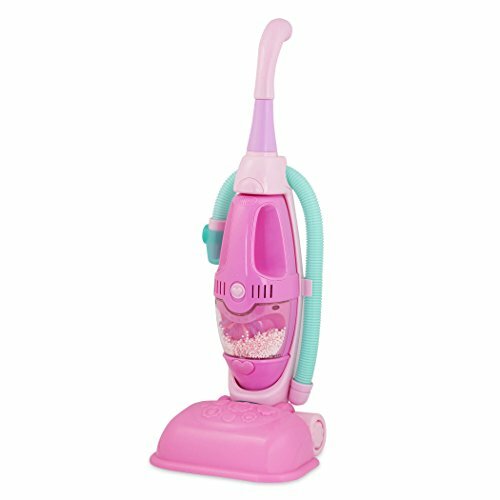 This toy vacuum is suitable for children 2 years of age and older and runs on three C batteries. It’s not a functioning vacuum cleaner, but it’s a great addition to your creative play area. This cleaning set is more than just a vacuum cleaner. A fun, brightly-colored cleaning caddy comes complete with vacuum, scrub brush, mop and bucket, broom and dustpan. Made of non-toxic ABS plastic, this toy set is BPA-free, phthalate-free, and lead-free. 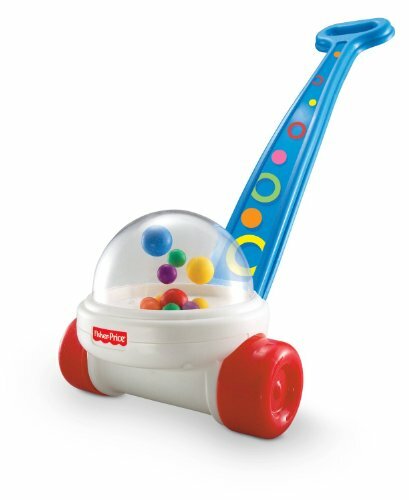 Your child will love the lights and music that accompany this toy. Suitable for children 3 years of age and older. This fully functional Dyson shares the same design and colors as the full-size vacuum in your home. If you’re looking for a toy vacuum that really works, this is worth a second glance. This is a lightweight stick model with working suction and cyclonic action — just like the real thing. It weighs in at about 2 pounds and runs on three AA batteries. Different vacuum attachments provide variety and encourage problem-solving skills. Sound effects add to the realism. Suitable for children aged 3 years and up. This Dyson toy vacuum is a great way to get your little helper involved in regular household chores. Working suction even allows your child to help keep the home a little tidier. This vacuum toy sports twist-and-turn action — just like the real deal. Sounds and moving colored balls make playtime more engaging. A removable debris drawer makes clean up after play easy. At 25 inches tall, this vacuum is suitable for children from 3 years. Four C-type batteries are required. This two-in-one vacuum set is the perfect size for older toddlers. An easy-to-grasp handle and sturdy structure allow confident walkers to maneuver with ease. Realistic swirling dust beads move in the body of the vacuum when running. This toy also produces vacuuming sounds when in use. While not a functional vacuum, it’s great for pretend play. Both a handheld vacuum cleaner and an upright cleaner are included in this set. For ages 3 years and up. 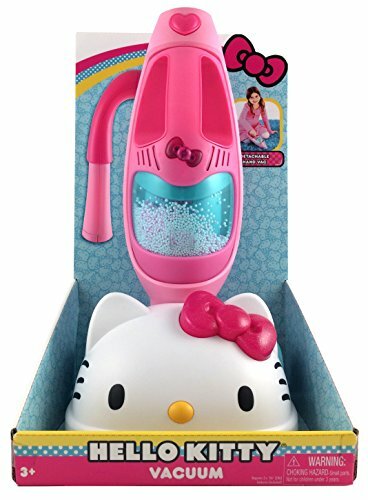 This cute vacuum cleaner sports the classic Hello Kitty face. Fun heart- and bow-shaped buttons add sound effects and lights when in use. This toy is recommended for children over 3 years old. 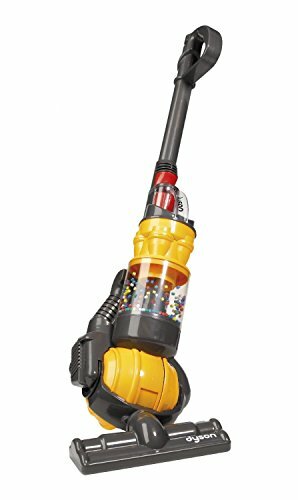 A removable middle portion allows the vacuum toy to be used as a smaller handheld vacuum as well. This toy runs on three AA batteries which are included with the product. This all-wooden set consists of 10 pieces and includes the vacuum and shaped “pieces of debris” to clean up. Wooden pieces of popcorn, coins, and cereal are all included. Roll the vacuum cleaner over the top of these pieces and they disappear from view (into the base). Simply remove the base tray to retrieve your debris and vacuum again. A great alternative to plastic and electronic noise, this wooden vacuum tilts and has a dial that turns and clicks. Brightly colored, this is an attractive toy that’s suitable for children ages 3 and older. 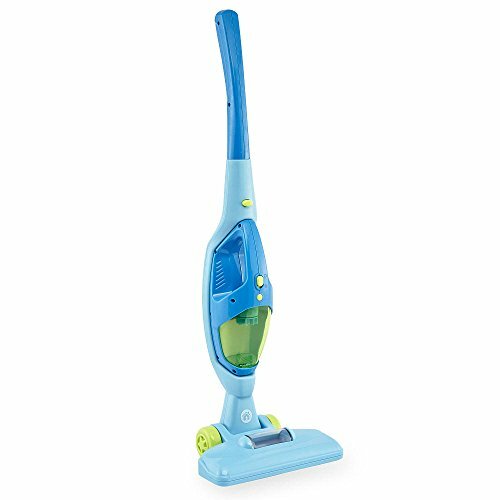 This blue vacuum is a nice option for a child who’s not looking for a vacuum cleaner or cleaning set that’s too “girly.” It’s a great size for little helpers and runs on two AA batteries, which are included. 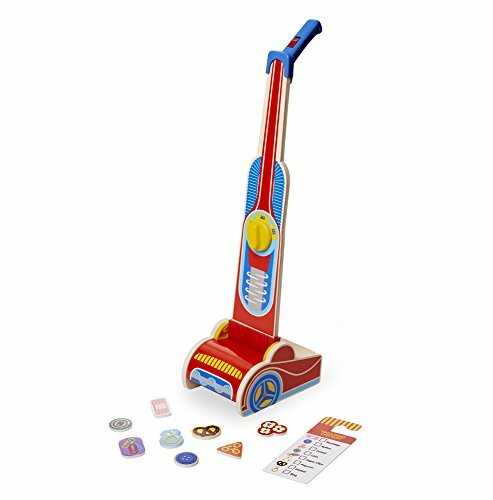 Great for children 3 years and older, this toy vacuum features a detachable handheld portion and has great light and sound features. Made from durable plastic, your child can have some fun imitating you. This vacuum cleaner actually vacuums. It comes with a removable vacuum cleaner bag that makes the experience even more real. As a bonus, you’ll like the light-duty cleaning this toy vacuum can do. Realistic sound effects and fun lights will have your child loving their vacuum playtime. This product runs on three AA batteries and is suitable for children aged 24 months and up. 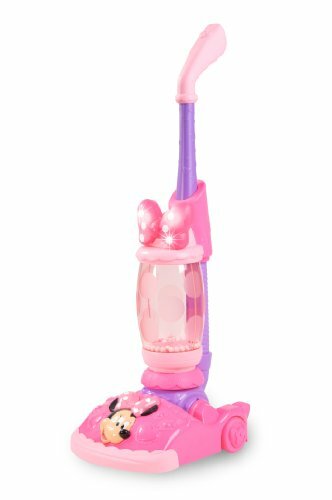 This Disney vacuum cleaner incorporates Minnie Mouse into clean-up fun. The oversized molded bow twinkles when in use, for added vacuuming delight. It also makes realistic vacuuming sounds. The transparent vacuum center has pearlized beads that spin and swirl when the vacuum is in use. It’s suitable for children 3 years of age and older. This toy runs on the included three AA batteries. Upright vacuums may be in style right now, but canister vacuums are a classic choice. 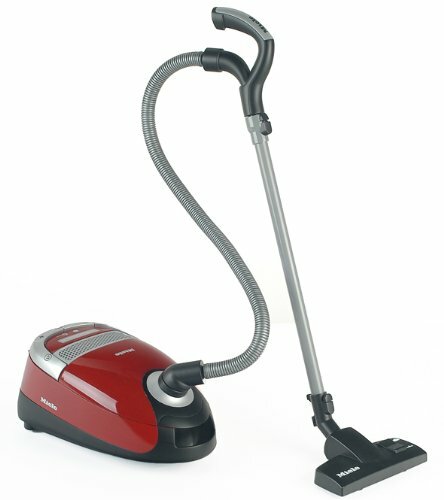 If you’re looking for a toy vacuum that looks like the canister vacuum you own, this Miele replica is a great choice. Fun and realistic, this toy offers a sleek European design and has lights and sounds. It runs on four C batteries and is suitable for children 3 years of age and older. There are some great toy vacuums out there. Whether you own a Dirt Devil, a Dyson, or a Hoover — there are toys out there that look just like it. You can give your child a great opportunity to emulate you, model adult behavior, and engage in pretend play. Any of the best toy vacuums above would be a great addition to your play center. If I had to choose only one, though, it would be the Living Pretend play cleaning cart. I love that it offers an alternative to the noisy plastic toys I already own. Its budget-friendly price point is also appealing. Do you have a child who loves to vacuum and do what you do? Have an overzealous helper at home? We’d love to hear about it — leave us a comment below.